As Spring begins in Ottawa city in Ontario, Canada, the gardens of Parliament Hill come to life in various hues as the tulips begin to bloom. The sunlight shines down upon each tulip giving it what it needs to open fully. The flowers in the background will take a few more days to open as they are still in bud form and require more growing. A beautiful flower which comes in various colors, red being one of the brightest, with each one having six petals surrounding a creative centre. 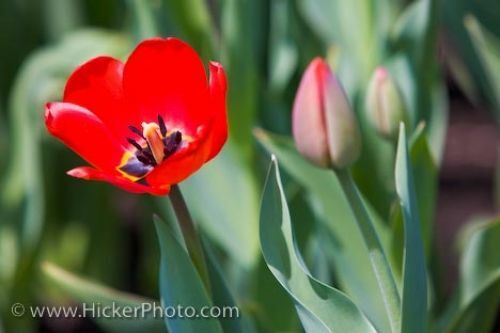 The tulip is a very common type of flower which adorns many gardens as they require very little care. When all the red tulips are in full bloom, the gardens of Parliament Hill are worth capturing a picture or two of. Tulips, Tulipa, in the gardens surrounding the Parliament Buildings on Parliament Hill, City of Ottawa, Ontario, Canada. Picture of a red tulip in full bloom in the gardens surrounding Parliament Hill in Ottawa City in Ontario, Canada.